Jeff Gothelf has just published an article in Smashing Magazine on How to Maintain Your Personal Brand as a Corporate Employee. He interviewed me, as well as David Armano and Luke Wroblewski, while researching the article, and I’m quoted a few times in it. Be respectful of your employer and their policies but find creative ways to promote yourself while promoting your company at the same time. Personal branding enhances corporate branding. It makes the company appear more “human” and approachable. It makes people want to work there and it attracts good press. If balanced correctly, this is a win-win for all parties involved. Note: I was scouring the net for images to illustrate this post with (if scouring constitutes typing “brand” into image search engines) and came across this interesting article questioning the concept or value of personal brands entirely. mentions, AOL, long story short Comments are off for this post. In Chapter 9 of the long-awaited new edition of Tidwell’s seminal Designing Interfaces: Patterns for Effective Interaction Design , she includes a kind shout-out to Designing Social Interfaces (on page 394, “What This Chapter Does Not Cover”). When my Bulletin article got written up in Metafilter, I started posting replies in haste without allowing the conversation to unfold naturally. I’ve spent a lot more time at Reddit in the last few years than at Metafilter, and more time than both on the Well. Along the way, I forgot some of my experience participating in communities when you’re not a regular but you’re not a noob. on metafilter at least. I get taken to school in mefi-tiquette. Still it’s a good reminder that I’m as prone as anyone to putting my foot in my virtual mouth and need to be a little less quick on the keyboard trigger finger. civility, community, designing social interfaces, flames, mentions, metafilter, long story short Comments are off for this post. Stupid pitfalls of social media: This American Society for Information Science and Technology paper by Yahoo’s Christian Crumlish has a tidy little cosmology of dumb things that social media does. Commenters seem inclined to discuss the html rendering of the Bulletin article at the ASIS&T website but a few chimed in to either agree with the observations or suggest that they’re perhaps rather obvious in hindsight. I wanted to add a comment suggesting that we welcome skepticism and critical feedback and that the wiki is open to editing by anyone, but the sign up procedure for the Boingboing blog involves a password email that I don’t seem to be receiving. 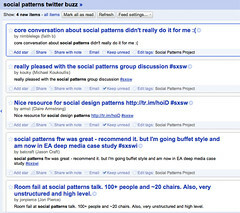 this is a screenshot of a sampling of the tweets about the core conversation i did with erin malone re social design patterns. there was one that said we weren’t prepared and were just promoting our book, too. i do wish we had explicated an example pattern. the summit talk with slides will be more useful, i think. but then this was a core conversation. we tried to seed it and then go with what the room wanted to talk about. that’s unstructured for a panel. also, we could have walked through the handout all together. live and learn. mentions, conventionology, Design, Patterns, Social Design, User Experience Comments are off for this post.